I posted a demo I did for a class I am teaching based on the "Reilly Method" of painting. Frank J. Reilly had a very controlled method of painting that has been well documented in three books. 2)Values for Pictures Worth a Thousand Words by Apollo Dorian- Also technically out of print, but you can send away for it. 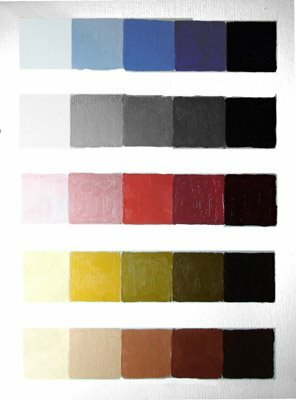 In short the "Reilly Method" utilizes a form of controlled palette in which you mix up to 10 values of reds, yellows, grays, fleshtones, and sometimes blue. I generally limit it to 5 to simplify for my student. In Reilly's teachings he would preach a way of calculating value accuracy through a combination of local value and a given planes angle to the light source. This requires a long term dedication to the study of form and its ability to refract light. To simplify I tell my students that on the average person the general value of flesh in the light is a 2 (if numbering 1-5, left to right on the chart above) halftone (planes at an oblique angle to the light) are a 3, general shadow(planes facing away from the light source are a 4, dark accents a 5, and highlights a 1. This of course is a huge over simplification, but a good way of learning to control your values when beginning to paint in color. You can increase accuracy and precision by adding more values, but this will also add complexity. Once you have established the correct value (often done using a burnt umber pick-out form of grisaille or underpainting) you can adjust the generic flesh tone by mixing in the corresponding red, yellow, or gray. Really interesting. Are you saying that the student physically pre-mixes these 25 values before even beginning to paint? I mean, does the student have these 25 small dollops of paint on his or her pallet before commencing the portrait painting? Thanks for the post. James- Yeah you premix all the little puddles. I think Reilly did ten values, but he would have students premix entire tubes. This way they didn't have to mix every time.